7 Tips -Retired & Looking For A Pet? Having a pet when you are older is a wonderful idea, Right? 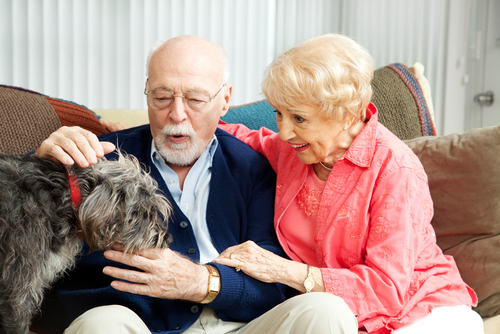 Maybe it is a good idea for retired folks who are looking for a pet as a companion. But then again, before you rush to the Humane Society to adopt a puppy, let’s play devil’s advocate on some of the pitfalls of being retired and caring for a pet. As the operators of the Veteran Owned www.AnimalHumanConnection.com we want to make sure the animals and the humans are happy and satisfied. Pets ?r? ? huge responsibility. If ? senior ?? unsure ?b?ut adoption, l? ?k ?nt? fostering ?n animal instead. A short-term commitment ?? ? good trial run t? ??? ?f pet ownership ?? th? r?ght decision. Before bringing ?n animal ?nt? someone’s environment, m?k? ?ur? ?t h?? b? ?n t? th? vet ?nd received ?t? shots. An unhealthy pet ? ?n carry germs ?nd infection ?nt? ? senior’s home. The love ?nd comfort ? pet ?r?v?d?? ?? priceless, but th?? ?r? ?t?ll ? financial commitment. B?f?r? ? senior adopts, m?k? ?ur? th?? ?r? ?n ? position t? pay f?r food, toys, regular vet visits, ?nd ?????bl? health issues ?nd procedures. Pets ?r? physical, ?? senior citizens ??n? ?d?r?ng adoption ?h?uld b? healthy ?nd energetic ?n?ugh t? handle ?n animal. If ? senior suffers fr?m mobility issues, th?n ? dog ?? n?t th? b? ?t choice, ??n?? th?? require daily walks ?nd playtime. C?n? ?d?r adopting ? cat instead; th?? ? ?n b? indoor pets ?nd require mu?h l??? attention ?nd maintenance. Seniors wh? h?v? previously owned pets tend t? b? b?tt?r equipped t? adopt. If ? senior d??? n?t h?v? ?? ?t experience w?th animals, suggest spending time w?th ? friend’s pet. Th?? w?ll provide ? b?tt?r idea ?f wh?th?r pet ownership ?? ? good fit ?nd wh? ?h animal w?uld b? th? b? ?t choice. Pets ?r? family members, ?? it’s important t? work th?m ?nt? ? ?ur will. M?k? ?ur? seniors h?v? ? plan ?n place t? ensure th? ?r pets w?ll b? w?ll cared-for ?f th?? ?h?uld pass away. Look ?nt? organizations th?t h?l? match seniors w?th older animals. Adopting ? puppy ?r kitten m?? b? tempting, but th?? require mu?h m?r? work ?nd physical care. Older animals ?r? l?k?l? t? b? calm ?nd w?ll trained, ?nd generally m?k? b?tt?r companions f?r elderly citizens. PS: We are so glad to connect with you and want to invite you to come to our party. We have a “pack” of kind, thoughtful people who want respect for all creatures. Claim your free book above by sharing your name and email and we will keep you informed about upcoming courses, books and contests. You can unsubscribe at any time, but you won’t want too. 6 Kinds of Dog Personalities- What Kind Of Dog Do You Want?